Of course we are all there because we love to read, right? No, I don't think so. I think book clubs exist to give us moms an excuse to get together, chat and eat yummy treats. That's why I go, anyway! Once or twice a year I get to host book club, which means... I get to try out some yummy recipes. Last night was no exception. I love to spend the day in the kitchen, preparing for my friends to come over and hang out for a little while after the kids go to bed (or are at least banished to their rooms!). These are Heavenly Filled Strawberries from my mother-in-law's cute blog. They are zero Weight Watchers points, if you're counting. Nothing else clocked in at the zero mark, by the way! I figured we could start with something healthy and go downhill from there. Next was Cinnamon Cookie Crunch Popcorn from Our Best Bites. They had me at "kind of like a chocolate covered cinnamon bear". I have yet to make something from those OBB girls that disappoints. Wow, they are amazing! There is even a template for a little print out to attach to the bag of popcorn! How convenient. Thank you, Sara and Kate. The main dish was this White Chocolate Raspberry Cheesecake from Meili's Home Baked Goodness. Just a warning, don't go to that blog and expect to not come away hungry! I think I want to make every single recipe. And oh yeah, I guess the book was pretty good, too. We read first book in The No. 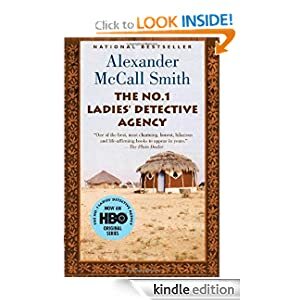 1 Ladies Detective Agency series by Andrew McCall Smith. I love these books. There are twelve, I think, with another one on the way in April. They are such a fun read and remind me of the semester I spent in South Africa right before I graduated from BYU. Such good memories. It was a fun night! Thanks, girls!! And that is why I love to come to book club at your house, Anne Marie! Fun (and yummy!) night.